In Switzerland, everybody with a garden owns one of these dark green, ugly containers. Every week, these containers are being rolled to the street. Every week, the garbage truck takes the green, compostable goods out of these ugly creatures. Everything is so clean and cozy in Switzerland. You cannot believe it before you’ve seen it or if you’re Swiss and you’ve travelled to other countries. I like cleanliness but I felt sorry for our container being so normal and nothing beautiful. Now, it became a little piece of art or an own personal identity. But meanwhile, I realized that there are not only green containers in Switzerland. They are yellow, and they take old newspaper. Or they are brown, and they serve for cardboard. Or they are black, and they should be used for normal garbage bags. Green, yellow, brown and black. It’s complicated. It’s very complicated. I know. 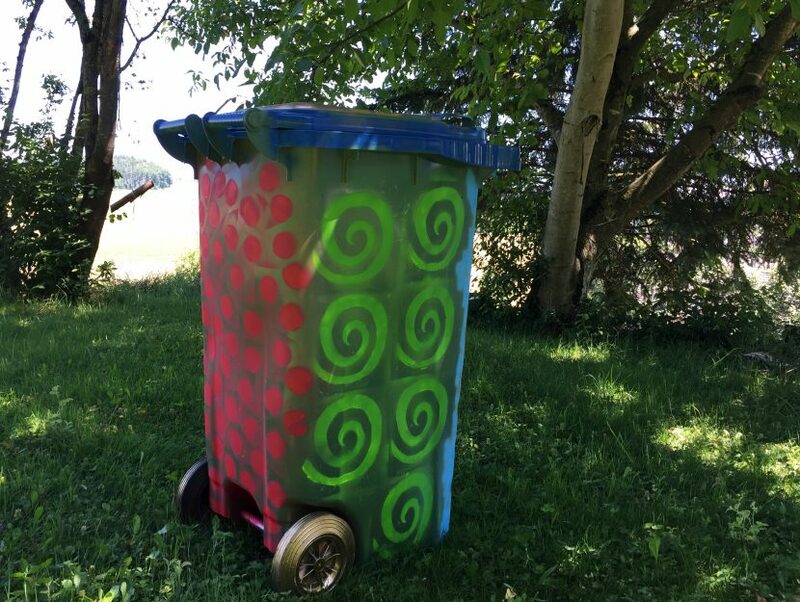 Our container is lime-green, blue and pink and has golden wheels. The garbage people will be confused. Or will they give it a little smile? Or do you think I’d have to repaint the container and turn it into dark green again? Everything is possible in standardized Switzerland. In case, I would let you know.